INDUSTRY.co.id - Jakarta - Being age 51 years, YARSI University re-adds a long list of partners. Coinciding with the graduation of academic year 2017/2018 on Saturday (14/4/2018) yesterday, the Rector of YARSI University Susi Endrini S.Si, M.Sc, Ph.D signed a Memorandum of Understanding (MoU) with four institutions at the 12th floor of the Ar-Rahman Auditorium, YARSI University Campus or YARSI Tower, Central Jakara. 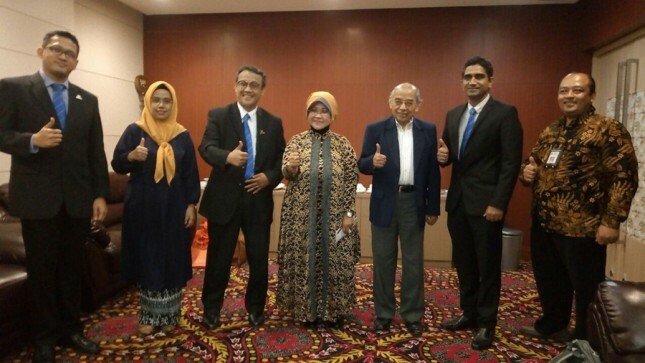 The four institutions, Perdana University (Malaysia), Bogor Agricultural University, Gama Mandiri Family (KGM), and Association of Medical Bio Informatics Singapore (AMBIS) agreed to establish cooperation in education, research, and devotion to Society and Entrepreneurship with YARSI University for the next five years. This collaboration is in harmony with the vision of YARSI University to become a university that can compete in the national and international sphere and play an active role in nation building through research that can deliver the University of YARSI become the world's top 500 universities. "As a research-focused university, YARSI University has an active role in supporting research needs in Indonesia. With this agreement, the opportunity for scientific research and scholarly cooperation between YARSI University and IPB and Perdana University-Malaysia and AMBIS-Singapore will be open," explained Rector Prof. Dr. Ir. Susi Endirini. In addition it is very open cooperation in the field of student and lecturer exchange, and cooperation in the teaching program. On the same occasion YARSI Foundation Chairman, Prof. Journalist Uddin hopes the signing of this MoU will be the starting point for strong links and trust for Prime University and AMBIS Singapore and can be an effective and productive medium for students to share knowledge and knowledge; this will be very useful for gaining experience across cultures. She also explained that the cooperation with KGM in the development of entrepreneurship among the academic community of YARSI is expected to become an effective mentor to create start up-start up young from the campus so that after becoming a scholar is no longer a burden of the state of intellectuals but able to offer solutions for the problems of the nation, especially solving the problem of unemployment and economic inequality of society. "The Foundation will fully support the research and development of any field of students as long as it impacts more productive changes and advancements, even I ask that every student should be able to make a proposal to encourage them to be more creative and innovative with new ideas or ideas," she explained again. Journalists call to support the creation of student creativity and innovation, the Foundation will not be stingy to finance it because the grant funds are not limited. So with the cooperation with various parties will also open the way open for YARSI University to realize the ideals as World Class University. FK UI alumni hope this memorandum of understanding can be implemented in the near future. The graduation of academic year 2017/2018 is led by the Rector of YARSI University, Prof. Susi Endrini with the number of graduates / graduates 335 scholars and 6 Masters of Management. Thus, until today's graduation, Saturday, YARSI University has graduated 8,718 alumni who profess their knowledge in various fields throughout the archipelago and some of them abroad. Interesting in this graduation there is a student of Niken Larasati who won two bachelor's degrees at the same time that is Bachelor of Medicine (Prodi Medical General) and Bachelor of Economics (Prodi Accounting) with same period that is four year. Other YARSI University students who have incised the achievement of Raudha Kasmir (Faculty of Medicine) became the representative of Aceh Province in Miss Indonesia 2018 and managed to reach runner-up 4. YARSI University, founded 15 April 1967 under the name of YARSI Medical College and became YARSI University in 1989 has managed 5 Faculties, namely Medicine (Dentistry and Medicine), Economics (Management & Accounting), Law (Law), Technology Information (Informatics Engineering and Library Science), and Psychology as well as Postgraduate programs Master of Management, Master of Notary and Master of Biomedical Science with total number of active students over 5,000 people.